Dispatched, from the UK, within 48 hours of ordering. This book is in good condition but will show signs of previous ownership. Please expect some creasing to the spine and/or minor damage to the cover. Grubby book. This book is dirty and has significant shelf wear, however all text is there and readable, as such it is acceptable for sale, and is still a good read. Thanks. Very Good. Colton Cowboy Hideout (Harlequin Romantic Suspense) by Cassidy, Carla, 2016-07-05. Mass market (rack) paperback. Glued binding. 288 p. Harlequin Romantic Suspense. Very good. New York Times bestseller Carla Cassidy kicks off another gripping Colton romance in cowboy country! Good. 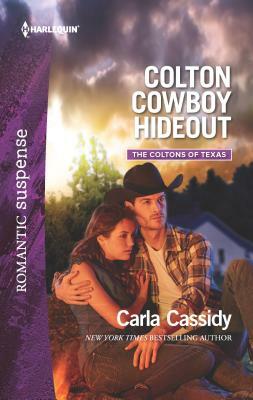 Colton Cowboy Hideout (Harlequin Romantic Suspense) by Cassidy, Carla. Mass market (rack) paperback. Glued binding. 288 p. Harlequin Romantic Suspense. Good. 0373279949 Ships from Tennessee, usually the same or next day.